Sony have announced their new top end apsc sensor mirrorless camera, the Sony a6500. It’s got some really cool features, but are they enough to make it the best option for surf photographers? The buffer is pretty nuts, 100 frames in RAW+jpeg mode, that means you could shoot at the highest burst rate for about 9 seconds without stopping. This is an advantage when you’re shooting sequences, but in my experience you’re unlikely to want to shoot bursts that long of surfing. It would be more useful from the land than the water but even then it’s not going to be a huge deal. Again this is something that will only be useful from the land. I had a Sony NEX5r and a Canon 70D which both had touchscreens, I used them a fair bit in general, especially for video. Changing your focus point and touching to select where you want to focus is the main reason for using a touch screen. If that’s something you do a lot then you will benefit from the touchscreen, if not it won’t make a huge difference in my experience. This is awesome for video shooters, it will definitely help get smoother video on lenses which don’t have stabilisation built in (Sony calls this optical Steadyshot or OSS on their lenses). Personally I don’t shoot much video of surfing with my a6000, at least not so far. If I did shoot video I’d probably use my Sony 55-210mm, my Sony 18-105mm f4, or my newly acquired Sigma 150-600mm C with MC-11 adaptor all of which have OSS or equivalent stabilisation. Of course, if I had a body with IBIS I’d be able to use every lens, even cheaper old lenses with an adaptor, and have them stabilised for video. For still photo’s and for video with the lenses I’m likely to use, IBIS is no advantage, and I think it would be the same for the majority of surf photographers. IBIS or OSS simply doesn’t matter when you’re shooting fast action like surfing. It compensates for camera shake, not movement of the subject. Any shutter speed (1/1000 or faster is a good general rule) that can freeze surfing action will be fast enough to eliminate camera shake issues too. For general photography, especially indoors, it’s a really big plus, but this is a site about surf photography, so that’s my main focus. It’s got the same video modes as the a6300, which are pretty good. If you need 4K resolution there are plenty of options available now from various manufacturers. I haven’t needed 4K yet, but my next camera body will definitely have 4K video, because my next TV will be able to do it justice. The menu is notoriously hard to get around quickly on the a6000. I’ve never run into any real issues myself, I know where the items I need to select are for the most part and I don’t change too many of them these days. 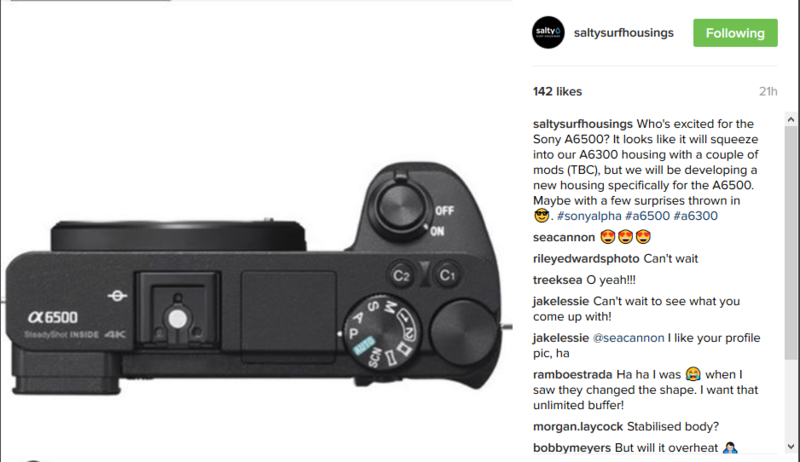 There’s no Sony a6500 water housing available off the shelf yet, but Salty Surf Housings have already announced they’re making a housing for the a6500. Their turn around time on a new model is much faster than any other manufacturer, so it should be available soon after the release of the a6500. You’ll definitely find it easier to find a housing for the a6000 or a6300 for the next few months. Once the Sony a6500 has been available for a while there are likely to be options at the same or similar prices to the current a6000 housings. I wouldn’t be surprised if you could fit the a6500 inside the Aquatech ATB housing – but it might require a new back plate and tray, or it might not be possible for some other reason, I’m sure we’ll hear soon. Should you buy the Sony a6500 for surf photography? Will this new thing let me take surf photos that aren’t possible with my current kit? I try to only consider cameras, lenses, housings, ports and other new items if they will let me take photos that I can’t already take. The Sony a6000 was smaller, had better autofocus and faster burst speed than any DSLR I could afford, so it allowed me to take photos that I couldn’t take with my DSLR. My Sony a6000 can take any surf photo that the a6500 can take, plus it’s smaller, there are water housings available off the shelf, and it’s an absolute bargain, especially second hand. It’s actually a better option than the a6500 for shooting still surf photographs right now. If you want to shoot surf photography from the water and land then the good old Sony a6000 is the best value camera you can buy. If surf photography is only a small part of what you take photos of and you have the money, go for the a6500. If you need 4K video but don’t have enough for an a6500 then get an a6300. So what would I buy with $1,400 US? If I had a GoPro and I was happy with that I’d go on a nice holiday instead. Are you going to buy the Sony a6500 for surf photography? Have I missed something obvious that makes it a killer upgrade? Let me know in the comments below or send me an email at ben@learningsurfphotography.com, I’m keen to hear any reasons to upgrade because I like shiny new things as much as the next person, I just can’t justify this one. It definetly looks enticing. Although, the RX100 V defintely caught my eye with 24fps burst, deeper buffer, improved AF and 4k. All for just $1000. Also you might have seen, they also launched an official Sony housing for all of their rx100 series. At just $350 it looks like it might be another good budget option for surf/dive photography. The only bummer is the fixed lens. Hi Andrew, I hadn’t noticed the official housing, thanks for the heads up. The rx100 range looks awesome for general photography, but the fixed lens really kills the potential for surf photography, at least from the land. There’s so much more you can do with an a6000 and a couple of lenses. I think the Sony HX400 or similar super zooms are more useful for surf photography, and will allow photos you can’t get with an a6000. I’ll investigate the housings and look into the water photography potential of the new rx100v in more detail though. Cheers. I could not say anything better than you here Ben. The A6000 is to me the best camera value if not ever since the Canon EOS600/630 back in the film era cameras. 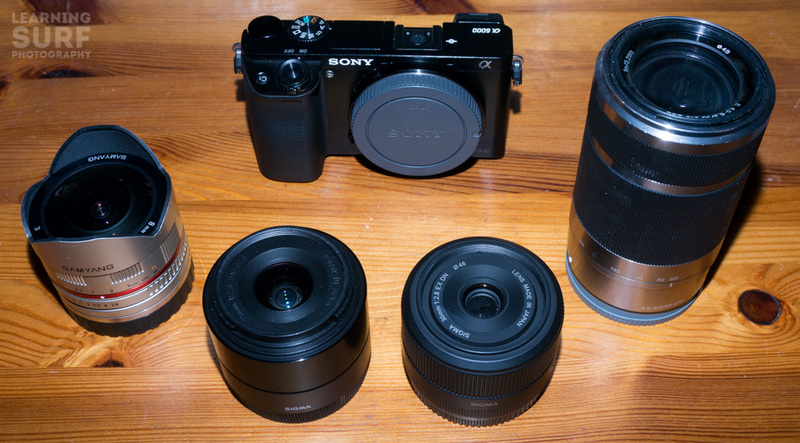 You just need to compare what features are available on the A6000 (as you did!) with the price you can buy this body! This is ridiculous, totally ridiculous!!!! Only 500 buck or so. Where the hell you can get a so affordable camera with so many good features for surf photography (24Mpx, 11fps, small and light body)? Those are the key of water photography success. How many of you will need the 4K video????? You have to think about your computer too when you think 4K. So unless you want to work for National Geographic Channel or make a BBC planet documentary 1080p will get you where you wanna go with ease. Of course Liquid eye will develop a new housing for this new camera as the grip is 4,5mm longer than the A6000 and A6300 it will not fit in our C6000 or C6300. But to me the A6000 will remain the best value of all and I hope Sony will non stop the production of this marvelous camera. How about the Nikon 1 AW1 Waterproof Camera? The AW1 was interesting when it was released, but there are rumours that Nikon are discontinuing the 1 system, and there aren’t many waterproof lens options available. I wouldn’t recommend it for surf photographers when there’s an alternative like the a6000 available. Can you add something to the Sony E 55-210mm F4.5-6.3 Lens to increase the zoom? With the 24 MP resolution of a still image there’s quite a lot of scope to crop the image and still have enough pixels to look good on a screen or small/medium print. With video in the a6000 you only have 1080p resolution, so if you crop the video you very quickly end up with blurry images on an HD screen like a TV, desktop monitor or even a decent mobile phone. The a6300 and a6500. Shoot 4k video, so if you output to 1080p you can crop it, but it requires a lot more processing power and time than cropping still images. Basically if you’re shooting video you want to avoid cropping if possible because of the lower resolution of the frame. So, If i use the Olympus TCON 17X to get closer am getting a lower resolution photo and video? You get the same resolution using the TCON 17X as any other lens. The difference is between the resolution of a still photo (6000 x 4000 pixels, which is 24 Mega pixels) and a frame of video (1920 x 1080 pixels on the a6000). 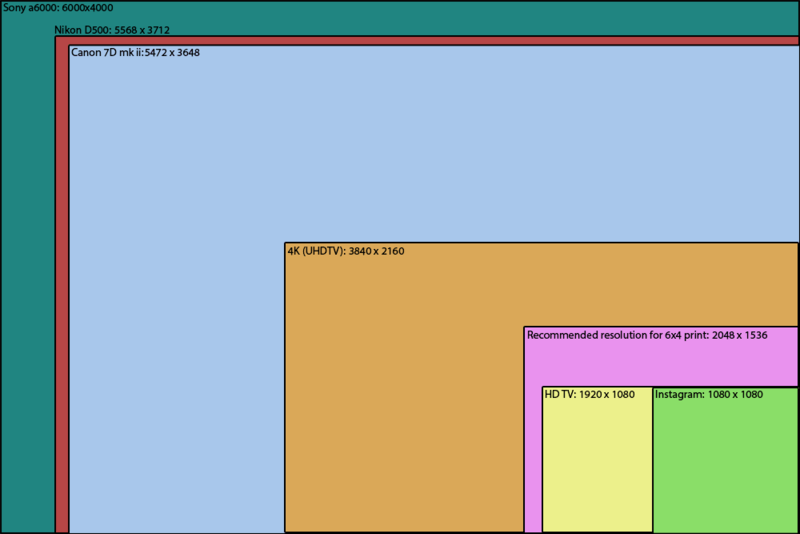 The biggest rectangle represents a still image from the a6000 (it’s not actual size, but all the rectangles are at the same scale so you can see how they compare). A 1080p HD frame is the yellow rectangle. The orange rectangle is a 4K frame, so that’s what you get with the video on the a6300 and a6500. I’ve attached an image which shows the different resolutions. So, say you wanted to publish an image of someone surfing on Instagram you could shoot a still image from the beach using the Sony 55-210mm and Olympus TCON 17X and then crop the surfer out of the middle of the frame right up until the size of the light green square, making them really big in the frame. But if you shot the same wave on video you’d have the same image on the file, but the resolution would only be the size of the yellow box. You would only be able to crop the sides off, if you cropped it any more the image would be stretched to fit the Instagram size of 1080 x 1080 so the pixels would be enlarged, losing resolution. Let me know if it doesn’t make sense and I’ll see if I can make a video to explain better. Great explanation..thanks Ben!! I actually didn’t even know you could crop video. The SX 520HS looks like a pretty good option for shooting from the beach on a budget. It would depend on how much you wanted to spend, you can get some benefits by going for a newer model in the same range, like the Canon SX60 HS, which has a longer zoom for instance, but you’d need to step up a fair bit to get a bigger sensor and/or interchangeable lenses, which would be the next step up in performance. The Sony RX10 series is probably the best superzoom cameras for surf photography, but you pay a premium for the latest models. Thank you very much for sharing your advice and experience. I’m an amateur (or semi pro) photographer but I have had my (above water) travel photography published (and paid for) in glossy magazines, like Conde Nast Traveller. I am going to phase out my desk job in the next 18 months and dive deep into my photography and learn film making (docos + art) starting this year. And I want to invest. I want my work (above water and underwater) published but I also want the option to enlarge my work into large scale pieces of art (like Eugene at Aqua bumps) that I can sell. I also eventually in the next 3 years want to make an adventure movie (like Dark Side of the Lense). I am going to the Mentawaii islands on a surf expedition next month. I have a Canon 5D Mark III and don’t use even a fraction of the functions. I have learned from experience that the simpler the kit, as long as it shoots very high quality images, the better I am as using them. I have another job so don’t have too much time to go deep into the tech stuff and besides the way I use tech is to play with it to see what it can do. I have a very good eye. I am going to buy the kit you recommend here – but I won’t to have too much kit to handle that doesn’t get used often. Is it worth me buying a lense adaptor to put my existing lenses on to the Sony or to invest in the correct size lense (not adaptor required) for the Sony? Is it worth me investing into underwater casing for my Canon’s or is this overkill if I have the lighter Sony? If yes which brand and size do you recommend? Is it worth investing in underwater casing for my iPhone to give me flexibility or is the not worth it? If yes which brand do you recommend? To get some class shots (stills or moving image) under water are there any other lenses you’d recommend that I consider down the track to have fun and to get different styles of shots? Big thanks and I hope this info will also be useful to others. Thank you Google (and your PPC or SEO) for helping me find you.